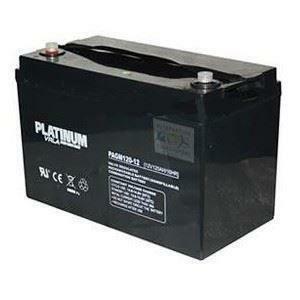 The 120Ah version of the Platinum AGM battery is by far the most popular size that we supply and has never let us down. The Platinum AGM battery range offers improved cycling capacity, vibration tolerance, durability and faster charging. Being a true AGM battery, the Platinum range can be used in any orientation and guaranteed leak free due to the non-liquid electrolyte system. The pure plate material in the Platinum range results in an AGM battery that will last 5-times longer than standard deep-cycle (leisure) batteries, charge 3-time quicker and significantly reduces self-discharge. As well as being able to use them in any orientation, you can also install them anywhere, because 99% of the gas produced under under normal use is re-absorbed. Works from -40ºC to +60ºC (depending on state of charge).